Don’t you love when a plan really comes together? I thought this sweets table was adorable. Now, I could be missing my mark here, but it doesn’t appear to be highly stylized…in other words, it might be DIY, y’all. I’m not sure. But it’s really done well, don’t you think? From the square of burlap that adorns the table to the lace cafe curtains in the back, it’s just all lovely. The macarons are a little fancy in my humble opinion, but they’re yummy and pretty, so we’ll let that pass. But I LURVE the caramel apples! And the PIE POPS! Pie pops, y’all! Couldn’t you just faint in ecstasy?? The rustic, homespun buttercream cake completes the look. 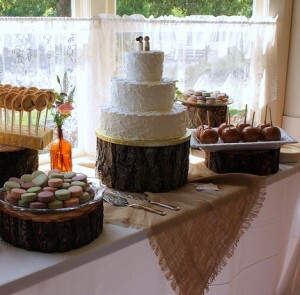 And I even like the tree trunk cake stands. Do you love the trend toward sweets tables, or do you think wedding cake is all that’s needed at a reception? Let’s hear your opinions below!